Copa America 2015: Why not Colombia? As a side fancied by many under the ‘dark horse’ umbrella at the 2014 World Cup, why shouldn’t Colombia be considered serious contenders to taste international glory when the competition is narrowed to the cream of the Americas? They were, of course, far from a million miles from home last summer, with the eyes of the sporting world descending on Brazil for football’s showpiece occasion. Not since the heady days of Faustino Asprilla, Carlos Valderrama and the late Andres Escobar back at the 1994 event had a Colombian side arrived at the biggest tournament on the planet with so much expectation surrounding their every move. In all honesty, in would have taken a superhuman effort to take the crown, particularly when taking into account the unfortunate loss of their star striker, captain and talisman to the most untimely of injuries. At that time, spring 2014, Radamel Falcao was still one of the most fearsome forwards around and a man tipped to set the grandest of stages alight when placed under the brightest of spotlights. Knee ligament damage was to scupper that dream, and it is easy to argue that he hasn’t been quite the same player since. Falcao has, however, spent the 2014/15 campaign mixing it with Premier League defenders at Manchester United and will feel that sporadic minutes in England will actually have helped to ease him back through the gears and have him fresh and firing when his country come calling. The same could be said for a domestic rival, Juan Cuadrado of Chelsea. It is fair to say the forward is yet to have the desired impact at Stamford Bridge following a winter window switch, so he will be determined to prove a point and get important minutes under his belt when operating in side with slightly less intense competition for places. There is also a certain James Rodriguez to add into the mix, with the talented 23-year-old having built on his eye-catching showings in Brazil to emerge as one of few Real Madrid players to end the 2014/15 campaign with credit and their reputation enhanced, and David Ospina, who has nailed down the number one jersey at Arsenal and looks to be the answer to a long-term poser for Arsene Wenger. 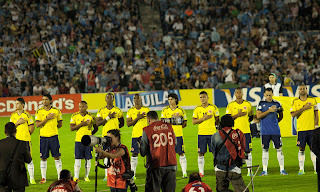 Colombia, it is clear, have stumbled upon a generation with plenty of potential still to be unlocked – with a number of players in their early to mid-20s - while also boasting experience in important areas – Falcao and Jackson Martinez up top and Pablo Armero, Juan Camilo Zuniga and Cristian Zapata at the back. If wily Argentine tactician Jose Pekerman can get his side to click, they could take some stopping this summer. A standing in Group C means they will once again lock horns with Brazil – their conquerors from 12 months previous – but Peru and Venezuela sandwich a meeting with the tournament favourites and anyone contemplating a flutter on international football betting markets such as those at bet365 should seriously consider Colombia before making their selection – particularly as an each way bet. They may not be the finished article, but all of the pieces are there and it is now a case of assembling that jigsaw in the right place, at the right time – and that could well be Chile between June 11 and July 4.